Martyn Hilbert's Railway Photography - Industrial Locomotives - Sentinel 01565 at Booths Rotherham. Sentinel 01565 at Booths Rotherham. 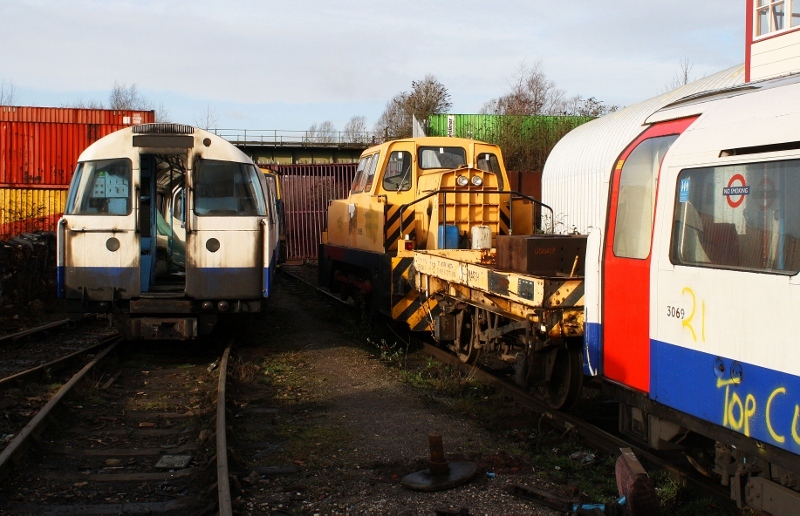 Flanked by withdrawn 1967 Victoria Line tube stock, Sentinel, 0-6-0 diesel shunter, works number 10144, number 01565 was in Booths Scrapyard, Rotherham on February 12th 2011. Formerly used by Jarvis Rail at York, the loco had been registered to run on the national network. At Booths, the loco was being used to shunt tube stock, coupled to a match truck.